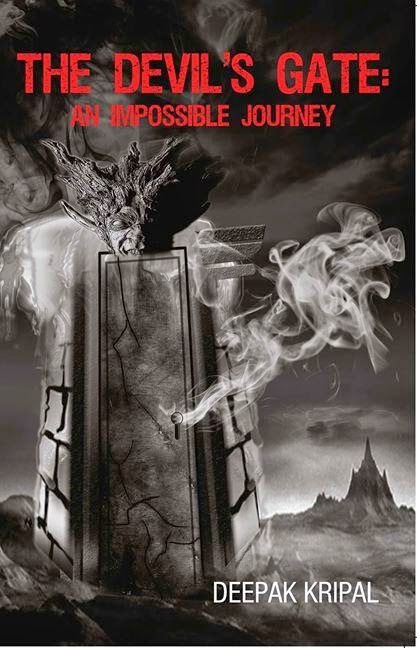 I am not sure how many of you have heard about this cute little book called 'The Devil's Gate:An Impossible Journey' by first time author Deepak Kripal which had hit the stores recently.Frankly speaking,even I was not aware about this book till it's author sent me a review request a couple of weeks back.I was a bit apprehensive about choosing this book for review but still decided to give it a try as the blurb managed to impress me. The Plot :Well,the story is pretty weird.United Animals (U.A. ),a secret agency meant for the protection and welfare of the animal kingdom decides to send their special task team comprising of a Cat (Katy) and a Dog (Dug) to the island of five hundred graves,an island which becomes visible only at night and widely believed to be inhabited by Devils.Their Mission is to negotiate with the Demons and persuade them to allow animals to inhabit the island as human beings are fast destroying their natural habitats.During their pursuit the duo gets an acquaintance in Billy,the tawny fish owl.True to the tag line,'TDG' narrates the story of the trio's impossible journey to meet the ruler of the island of five hundred graves.The climax is open ended leaving room for a sequel. The Characters: The book has three principal characters.Katy-the stubborn but intelligent Cat;Dug-the 'trained' yet jovial Dog and Billy-the geeky and philosophical Owl.These three characters have been well etched out though the dialogues given to them go overboard quite often.The villain and the peripheral characters are also well written and the author definitely deserves applause for lending some degree of believability to his characters. The Writing:It's hard to believe that 'TDG' is a debut work.The writing is imaginative,well researched (honestly,I didn't know that there was a prehistoric fish called Dunkleosteus) and packed with enough twists and turns to keep even the most disinterested reader hooked to the proceedings.Except for the heavy philosophical lines which appears often,Deepak has used simple,conversational English to tell his fantasy tale.Infact it's his competent writing which makes even the most implausible of the situations/scenes work. Possible Inspirations and references: The overall tone of the story is similar to that of the 'Madagascar' series and Nikhil Advani's National Award winning animation adventure,'Delhi Safari'(animals embarking on an adventurous journey).Though the inspiration is pretty evident,the book never relegates itself to a bargain-basement version of the above two. 'TDG' definitely has an original and a solid story to tell and succeeds in it's efforts to a very large extend.Likewise,I believe that the inspiration for the 'island of five hundred graves' comes from the algae island in 'Life of Pi'. 1.The scene in which Katy meets Dug for the first time. 2.The sequence in which Billy rescues Katy and Dug from Kako. 3.The meaningful dialogues (though their placement and relevance in a genre like this are debatable). Sample this-" I know about a resource that is fading,humanity it is"
What I didn't Like: The book isn't entirely devoid of flaws. 1.The heavy duty philosophical dialogues between the animals (Katy- Dug-Bill) though well written don't quite gel with the overall mood of the book. 2.The pace slackens a bit towards the middle.A little bit of editing could have made these portions crisper. 3.Another thing which I felt is that the animals in the story quite often talks and behaves like humans.